The Cyrus Three Seater Sofa offers a welcoming calm elegant retreat from the hectic world around us. 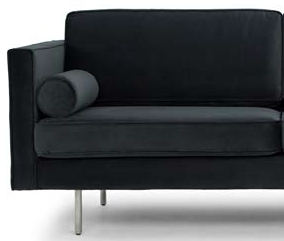 Cyrus features a casual contemporary design with matching piping details that works perfect in most interior settings. The sophisticated sofa rests on solid brushed stainless steel legs give that sofa its touch of elegance. Cyrus Sofa is available in Azure Blue, Shadow Grey, Dusty Blue, Grey Tweed and Midnight Blue.